Where India will become the new South Pole, lands nearby can expect to move from the near equatorial climate they experience now to severe cold such as Siberia and northern Canada experience. Jolting earthquakes from the nearby fault lines adjusting to the effect of having a moving crust come to a crunching halt will take its toll on Turkey, but as this part of the world is experiencing a stretch, rather than compression, there will be no hot earth or subducting land to be a concern. In addition, these lands ride high so will escape the rising waters from melting poles. Those unprepared for a sudden drop in temperature will be the worst off, both from the standpoint of clothing and agricultural practices. Turkey is riddled with fault lines, as a quick glance at a map shows. Fortunately, Turkey is high ground, and anyone within the country can position themselves in the center of the country for the pole shift, 100 miles from shore and 200 feet above the current sea level. One should not be on the border with of the Arabian Plate, as the Arabian Plate will roll its top part to the East, jumbling rock in its path. 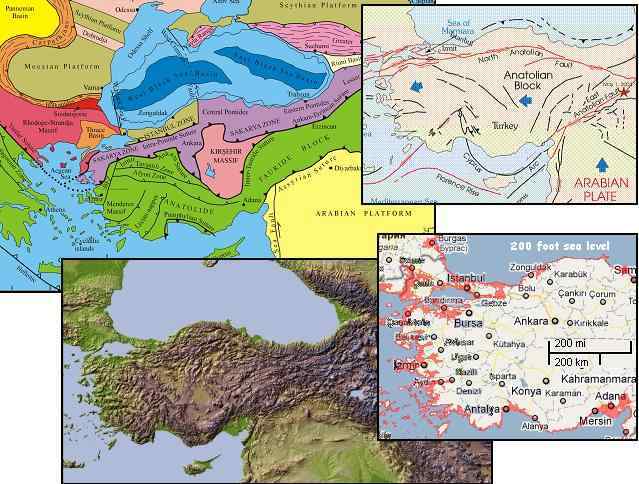 One should not be on the North Anatolian Fault Line, if one has their options, as like all fault lines there will be movement and tumbling rock. If forced to stay near the coastline of the Black Sea one should seek a point 400 or greater feet above sea level, while avoiding the tumbling rock in the higher mountains along the fault line. When the 7 of 10 scenario for Africa occurs, dropping Africa and widening the Red Sea, the isthmus holding Istanbul will tear, dropping the city into rubble. During the hour of the pole shift, what is left of Istanbul will find water sloshing back and forth between the Mediterranean and Black Sea, and will be gravely affected by quakes along the various fault lines that traverse the area. Tsunami will not be the issue during the Earth changes affecting Turkey, as the fault lines move horizontally and will not raise or lower plates on either side to create a mass of water on the move.